Preface: Robert Bly assigned the students in his Stanford Poetry Workshop to write an 8-line ramage poem focusing on one vowel for his May 6 class. I wrote "Bazaar Dreams" focusing on the short "a" sound and printed out a copy in the Art Library. After reading it, I realized that it didn't contain what I really wanted to say, and started another ramage that contained the names of avatars with the "ah" and "ha" sounds. Soon my poem expanded beyond the 8-lines for a ramage, evolving into a seven-stanza poem of three lines each. The poem was finished in about an hour. When I asked Bly whether a ramage could be more than 8 lines since mine ran to 21 lines. Bly growled in his joking way, "We'll just throw you in jail!" I was about to read this poem, when one of the students (Austen) had to leave the class for another of her classes. So I gave her the floor to read her poem before she left. Other students were asked to read their ramage, and Bly never returned to me. When Bly told the students on May 28 that this was his last class. He asked each of us to read a poem, so finally I read "The Aha Moment". Bly said "This is the best one you've written!" He asked me to explain some of the details which I did for the class, and am now including in my notes below. A fakir is a Sufi who performs feats of endurance or apparent magic. Derived from faqr (Arabic for poverty). The word refers to either the spiritual recluse or the common street beggar who chants holy names, scriptures or verses. Fakirs may be seen walking barefoot on burning coals, sitting or sleeping on a bed of nails, or "living on air" (refusing food). Sir Winston Churchill once contemptuously criticised Mahatma Gandhi for "posing as a half naked fakir". 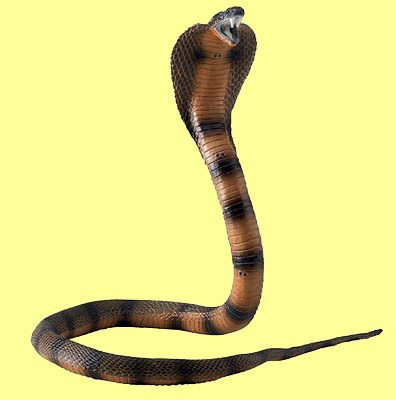 On streets in India, snake charmers will play their pipes or flutes for the King Cobra to rise from their baskets. While such scenes attract throngs of tourists, the real symbol of the cobra rising is the awakening of kundalini in the spine of the yogic practioner. Kundalini means "coiled" in Sanskrit. In Hindu yoga, it is envisioned as a sleeping serpent coiled at the base of the spine. Sir John Woodroffe (pseudonym Arthur Avalon) wrote about this libdinal energy in The Serpent Power: Secrets of Tantric and Shaktic Yoga (1924). Yoga and Tantra propose that this energy may be "awoken" by austerities, breathing, chanting, and meditation. The serpent energy rises up a subtle channel at the spine (called Shushumna) to the head passing through the seven chakras bringing psychological illumination. It is interesting that Hippocrates, Father of medicine chose the caduceus as the emblem of the physician. This logo of twin serpents rising on a rod (spinal column) with wings on top (enlightenment) has a deep spiritual significance that is lost to modern medical practioners. Arjuna is one of the heroes of the Hindu epic Mahabharata of which the Bhagavad Gita is a fragment. Arjuna's name means 'bright', 'shining', 'white' or 'silver' (Latin argentum). 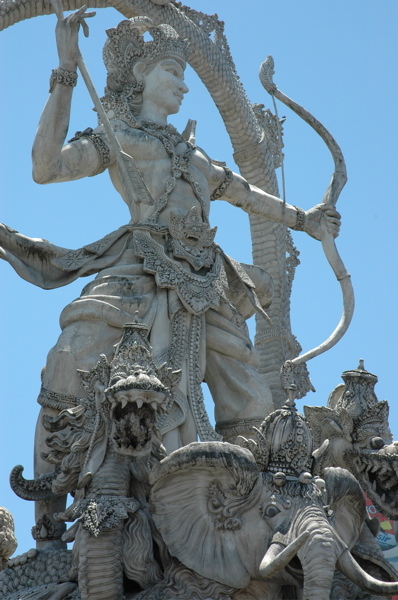 Arjuna is thus "The Peerless Archer". In the Bhagavad Gita, the god Krishna disguises himself as Arjuna's charioteer and imparts spiritual lessons to him before and during the Kurukshetra Battle. Confronted with his kinsman, Arjuna's courage falters as the battle is about to begin. Krishna tells Arjuna that it's his duty to struggle to uphold righteousness, without consideration of personal loss, consequence or reward; the discharge of one's moral duty, he says, supersedes all other pursuits, whether spiritual and material, in life. 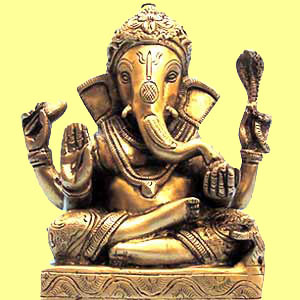 Ganesha is one of the best-known and most worshipped deities in the Hindu pantheon. Although he is known by many other attributes, Ganesha's elephant head makes him easy to identify. Ganesha is widely revered as the Remover of Obstacles and more generally as Lord of Beginnings and Lord of Obstacles (Vighnesha, Vighneshvara), patron of arts and sciences, and the god of intellect and wisdom. He is honoured at the start of rituals and ceremonies and invoked as Patron of Letters during writing sessions. A friend who attended numerous Bhagavad Gita talks in Boston by Swami Chinmayananda got married in India. When Sheila returned and saw me, she told me to close my eyes and placed something in my palm. When I opened my eyes, it was a tiny statue of Ganesha. One yelled out "A shock for only a rupee"
then dangled out his eyeballs with muscles and all. "It goes in... It goes out"
"Just bring me a flower and I'll teach you." After presenting my flower to this sage, he blessed it on a small table with his guru's photo and a candle, mumbling some mantra. Then he gave the flower back, telling me to press it in a book for safe-keeping. I was told to ask three questions, so I told him that I've been meditating for three years and why I'm not enlightened yet? and how to become enlightened? He answered "You've never been taught the method which I'm going to teach you right now." The secret to enlightenment is the breath. When we breathe in, there's the "Ah" sound. When we breathe out, there's the "Ha" sound. It's all quite simple breathing is life. In his Stanford Poetry Colloquium (May 23, 2006), Li-Young Lee said "My father told me that humans take 15,000 breaths a day. When I inhale, I say 'Thank you'. When I exhale, I say 'Good-bye'. This helps you to rest your mind and breathing." the babe's first words "Mama" & "Dada"
Rama, Buddha, Krishna, Mahavira, Mohammed. An Avatar in Hindu philosophy is the descent or incarnation of a divine being on earth in human form. In some cases, a spiritual leader outside the Hindu tradition would also be considered as an avatar who comes to uplift people in times of crisis. Ammon-Ra: Amun (Amon) was the name of a deity, in Egyptian mythology, who gradually rose to become one of the most important deities in Ancient Egypt. As Amun's cult grew bigger, Amun rapidly became identified with the chief God that was worshipped in other areas, Ra-Herakhty, the merged identities of Ra, and Horus. Hence a merger of identities, with Amun becoming Amun-Ra. Ra-Herakhty had been a sun god, and so this became true of Amun-Ra as well. Zarathustra: An ancient Persian prophet and religious poet. Also called Zoroaster (circa 618-541 B.C.). He saw himself as the messenger of Ahura Mazda, Lord of Light. His Gathas hymns teaches life as a struggle between "truth" (light) and "lie" (darkness). The purpose of life is through the exercise of good thoughts, words and deeds. Rama: The seventh Avatar of Vishnu as described in Bhagavata Purana. Rama is one of the most popular figures and deities in Vaisnavism and its religious scriptures in Southeast Asia. Stories concerning Rama come from the Indian epic Ramayana. Rama is the husband of Sita, who Hindus consider to be an Avatar of Lakshmi and the embodiment of perfect womanhood. Krishna: A Hindu deity as having the appearance of a dark-skinned man during his earthly incarnation. He's often depicted as a young cowherd boy playing a flute (Bhagavata Purana) or a youthful prince giving philosophical discourses and guidance to Arjuna (Bhagavad Gita). Buddha: In the Hindu Puranic text Bhagavata Purana, Buddha is 24th of 25 avatars, prefiguring a forthcoming final incarnation. Siddhartha Gautama (563-483 BC) was born a prince, and became Buddha ("The Awakened One") and the founder of Buddhism who rejected the Vedic teachings of the Hindus. Theravada Buddhists view him as a super-human personage of supreme teaching skill and wisdom. Mahayana Buddhists see him as a projection of an eternal, ultimate principle of Buddhahood that is immortal and transcendent. Mahavira: The founder of Jainism who lived from 599-527 BC, was a contemporary of Buddha. Likewise, he was born as a prince called Vardhamana. At age 30, he renounced his kingdom and family, becoming a travelling ascetic for 12 years. His courage and braveness in meditative discipline earned him the name Mahavira "Great Hero". His teaching is to achieve spiritual excellence by ethically sound behavior and metaphysical thought. Mohammed: Regarded by Muslims as the messenger and prophet of God, he lived from 570-632 A.D. Mohammed is the founder of the Islam religion. Discontented with life in Mecca, he retreated to a cave in the surrounding mountains for meditation and reflection. At age 40, he received a revelation from God. Three years later Muhammad started preaching that complete "surrender" to God is the only way. Mohammed said that he was a prophet and messenger of God, in the same vein as Adam, Noah, Abraham, Moses, David, Jesus, and other prophets. These name changes occurred in Genesis 17.5 & 17.15 when God came to Abram when he was 99 years old. "Neither shall thy name any more be called Abram, but thy name shall be Abraham; for a father of many nations have I made thee." Abram means "exalted father" and Abraham means "father of many nations". Sarai means "my woman of high rank" referring to her relationship with her husband Abram. "And God said unto Abraham, As for Sarai thy wife, thou shalt not call her name Sarai, but Sarah shall her name be." Sarah, means "mother of nations". With their name changes, Sarah who was barren for many years gave birth to her first child Issac at the age of 90 when Abraham was 100. God instructed Abraham to name the son Issac after the laughter which Sarah had made when her son's birth was prophesied by the angel. What I find fascinating is the added sounds to Sarah and Abraham spell out "Ah ha" interjection signaling surprise. Sarah was surprised giving birth to Isaac at age 90. When detectives or scientists solve an intriguing puzzle or problem, they often exclaim "Ah ha!". Allah: The standard Arabic word for "God". In Islam, Allah is the name of the nameless God, the pivot of the Muslim faith. He is transcendent creator of the universe, and the judge of humankind. Among the 99 names of Allah, the most famous and most frequent of these names are "the Merciful" (al-rahman) and "the Compassionate" (al-rahim). Muslims repeat phrases like "La-il-la-ha-il-Allah" (There is no deity but God) and "Allah-o-Akbar" (God is great) as a devotional exercise of remembering God (zikr). In a Sufi practice known as zikr Allah (remembrance of God), the Sufi repeats and contemplates on the name Allah while controlling his or her breath. Brahma: The Hindu god of creation and one of the Trimurti, the others being Vishnu (Preserver) and Shiva (Destroyer). Brahma is not to be confused with the Supreme Cosmic Spirit in Hindu Vedanta philosophy known as Brahman. According to the Puranas, Brahma is self-born (without mother) in the lotus flower which grew from the navel of Vishnu at the beginning of the universe. Brahma is said also to be the son of the Supreme Being, Brahman and the female energy known as Prakrti or Maya. Tantra: An esoteric tradition rooted in the religions of India. It exists in Hindu, Buddhist, and Jain forms, and believes that the universe we experience is nothing other than the concrete manifestation of the divine energy of the Godhead that creates and maintains that universe. According to Tantra, being-consciousness-bliss or Satchidananda has the power of both self-evolution and self-involution. In this process of evolution, Maya conceals Reality and separates it into opposites, such as conscious and unconscious, good and evil, etc. If not realised as illusion, these determining conditions bind, limit and fetter the individual ego (jiva). Torah: The inspired words of God revealed to Moses and recorded in the Pentateuch (Five Books): Genesis, Exodus, Leviticus, Numbers, Deuteronomy to guide the Jewish people. The word "torah" means "teaching", "instruction", "scribe", or "law" in Hebrew. The Hebrew term Sefer Torah refers to a formal written scroll of the five books, traditionally written by a specially trained Torah scribe under very strict requirements. Zohar: Called The Book of Splendor is considered the most important work of Kabbalah & Jewish mysticism. It is a mystical commentary on the Torah (five books of Moses), written in Castile near the end of the 13th century by Moses de Leon. It contains a mystical discussion of the nature of God, the soul, and the origin and structure of the universe. Kabbalah: The root meaning is "received" (revealed and handed down as a mystical secret of Judaism). It is a set of esoteric teachings meant to define the inner meaning of both the Hebrew Bible and traditional Rabbinic literature, as well as to explain the significance of Jewish religious observances. Via Dolorosa: Latin for "Way of Grief" or "Way of Suffering", it is a street in the Old City of Jerusalem. Traditionally, it is held to be the path that Jesus walked on the way to his crucifixion. It is marked by nine of the fourteen Stations of the Cross. The last five stations are inside the Church of the Holy Sepulchre. It is a focus of pilgrimage. A manta is a mystical syllable or phrase usually from Sanskrit given by a guru to disciples to aid their meditation. They are used primarily as spiritual conduits, words or vibrations that instill one-pointed concentration in the devotee. Mantras divert one's mind from illusion and material distractions. Chanting is the process of repeating a mantra. In Hinduism, the syllable Aum (Om), is considered a primordial mantra, representing Brahman, the One Reality, as well as the whole of creation. For this reason, Aum is prefixed and suffixed to all Hindu prayers. Some common mantras used by bhakti yogis of devotion include: Aum Namah Shivaya (Aum and salutations to Lord Shiva), Aum Namo Narayanaya (Aum and salutations to Lord of the Universe), Hare Krishna Hare Krishna, Krishna Krishna Hare Hare, Hare Rama Hare Rama, Rama Rama Hare Hare (Invocations to the 7th & 8th Avatars of Vishnu: Krishna & Rama), Om Shanti Shanti Shanti (Om Peace Peace Peace). It is interesting that the Ah & Ha syllables appear often in these popular Hindu mantras. letting out the air gently through your teeth. The sage who taught the secret of breathing the "Ah" inbreath and keeping the "Ha" outbreath came from the Himalayas to Boston to teach this secret. Before coming to Boston, the sage taught his breathing technique to Melvin Calvin of Berkeley, who experienced ecstatic dream states afterwards. As a chemist, I knew that Calvin had won the 1961 Nobel Prize for his research on the chemistry of photosynthesis. So I felt safe in learning this strange way of breathing. I abandoned it after a month when a postdoc colleague was driving me home one day from Brandeis University. He asked me "Do you hear that hissing sound? Is it coming from my car?" I was embarassed to tell him that it's the "tzzz tzzz" noise coming between my teeth! The Himalyan sage did not tell me this in Boston. The idea came to me just now thinking about Emily Dickinson's Letter #618 (1879) that the purpose of the philosopher's stone (alchemy) is "in making others happy". So keeping Happiness in one's heart will not only extends one's own life but bring joy to all those around you. This is the real alchemy and true yoga of enlightenment. Namaskar or Namasté is a is a common spoken greeting or salutation in India expressing deep respect. Taken literally, it means "I bow to you". The word comes from Sanskrit (namas): to bow, obeisance, reverential salutation, and (te): "to you". The gesture with palms touching and fingers pointed upwards in prayer position, in front of the chest is also made wordlessly upon departure. In Buddhist culture, this gesture is called gassho and expresses reverence and thankfulness. In yoga and meditation, it means "I bow to the spirit within you" or "I salute the God in you". Darshana or darshan is a Sanskrit term meaning "sight" or a "vision of the Divine". One could "receive darshana" of the deity in the temple, or from a great saintly person, such as a guru. The spiritual devotee seeks darshan from the guru in the form of his touch for blessings to aid his path to enlightenment. I first learned about darshan from reading Ramana Maharshi and how he enlightened spiritual seekers who visited him for darshan. 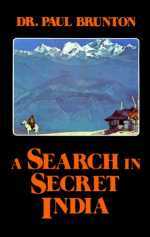 After experiencing enlightenment in Ramana's ashram, Paul Brunton introduced Ramana Maharshi to the West in his book Search in Secret India (1934). Another example is Robert Adams who was enlightened at age 18 by Ramana in 1946. Archimedes (287 B.C.-212 B.C.) the Greek mathematician and leading scientist of classical antiquity discovered specific gravity in his bathtub. He is said to have ran to the streets naked shouting "Eureka!" ("I have found it!"). Such "aha moments" come to a detective finding a clue that solves a mystery or to a scientist hitting upon a solution to a long perplexing problem. When the mind takes such a leap, one is experiencing a taste of nirvana used by the Buddha to describe the perfect peace of the mind that is free from craving, anger and other afflictions. Nirvana is the goal of meditation, yoga, and the spiritual quest to "Know Thyself". Buddha in The Dhammapada says of nirvana that it is "the highest happiness". This happiness is rather an enduring, transcendental happiness integral to the calmness attained through enlightenment or bodhi, than the happiness of blindful entertainment.